The product, available on Toyota's walkie rider and three models of its AC electric pallet truck line, won the highest ranking in the Material Handling Systems category - gold. 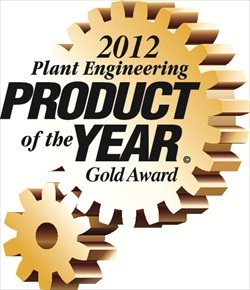 The annual Product of the Year program, now in its 25th year, recognizes innovation in manufacturing products. According to the publication, this award sets the manufacturing and engineering industry standard for new product achievement. Award recipients are determined based on votes received from the qualified subscribers of Plant Engineering magazine, whose readers include plant managers and plant engineers. This achievement was formally acknowledged at the 2013 Engineering Awards in Manufacturing Dinner, hosted by CFE Media LLC, publisher of Plant Engineering, in Chicago on March 18th. "It is rewarding to have Toyota's Galvanized Chassis option recognized by top industry decision makers, plant managers and engineers, who rely on new product innovations to address some of today's logistics challenges," said Jeff Rufener, president for TMHU. "This honor demonstrates the Galvanized Chassis option's value to customers needing rust-resistant, money saving benefits for corrosive environments." Toyota's Galvanized Chassis option protects the vehicles while operating in wet environments. It is available on the 7-Series electric walkie pallet truck (4,500 pound capacity), 8-Series AC electric walkie pallet truck (6,000 pound capacity) and 8-Series end-control walkie rider (6,000-8,000 pound capacity). This chassis enhancement is ideally suited for customers who move materials in and out of: cold storage facilities; chemical and salt and brine industries; or in areas where frequent wash down is required to remove contaminants.